What can I learn from Mat Fraser and other elite athletes to better my performance? One principle that transcends all elite performers is consistency over time. Before we dive into the power behind consistency, let’s first breakdown why it’s important and how it affects 3 important aspects of our life and training. Life is full of rhythm: The sun rises and the sun sets. We wake and we sleep. We start the day and we end the day. And when I speak of rhythm, I want you to think of consistency as rhythm is the byproduct of repeated or consistent patterns. Each day we are all unconsciously moving through circadian rhythm. Daily cycles of physiology and behavior that are driven by an endogenous oscillator with a period of approximately 1 day. As mentioned in a previous post, the suprachiasmatic nuclei (SCN) are the primary circadian oscillators which influence peripheral tissue clocks via endocrine, autonomic, and behavioral cues. Majority of all peripheral tissues contain circadian clocks as well. Our body operates under the pretense of rhythmical actions and schedule to allow for maximal efficiency. The more consistent and scheduled our daily activities are the less unwanted stress and chaos imposed upon our system. Knowing this, Let’s look at 3 important areas that affect all of us on a daily basis and see how greater consistency can play a vital part in our success. One aspect that most people are fairly consistent with is their training time. Consistent physical exertion away from feeding times is a powerful way to ensure optimal performance in the gym. As the body begins to learn and build a daily pattern as to when you train, it will begin to coordinate necessary hormonal secretion, increased cardiac output, and subsequent vasodilation most importantly to the periphery before you begin your training session. The wheels on the system will start turning ever so slightly before the gas pedal is pushed down. And this unconscious automated adjustment is the byproduct of consistent exposure. When we start to introduce some variability in our schedule, we start to challenge the system’s current operating model with new inputs. As a result, the body might be resting and digesting when we want to throw it into full throttle and challenge all opposing systems to its current programmed routine. There are times when changes in our schedule or out of the blue commitments come up and we have to adjust our window to train and that is understandable. The key is ensuring 99% of the time we are consistent with our training time to allow for optimal physical expression. One aspect of daily rhythm that most people are not as aware of is consistent meal timing. When the time approaches for us to eat, our body begins releasing enzymes and hormones beforehand to start the digestive process. Similar to the automated processes we discussed when it comes to training time. Additionally, the body will begin to bring blood back into the gastrointestinal tract to help facilitate digestion. If we miss a meal or decide to replace our meal with an additional training session, we can induce a mild stressor on the body by going against the prepared plan of action. The body was in the process of sending blood to the gut, digestive enzymes were beginning to rise, but now we need to divert blood back to the periphery, to the muscles, inhibiting our parasympathetic response to begin ramping up sympathetic drive for the training session. The more often we fluctuate this, the more challenging it is for the system to “know” when it’s time to digest food versus when it’s time to “fight.” Take the time to figure out what times during the day work best for you, plug it into your calendar, honor that time, and stick to it. 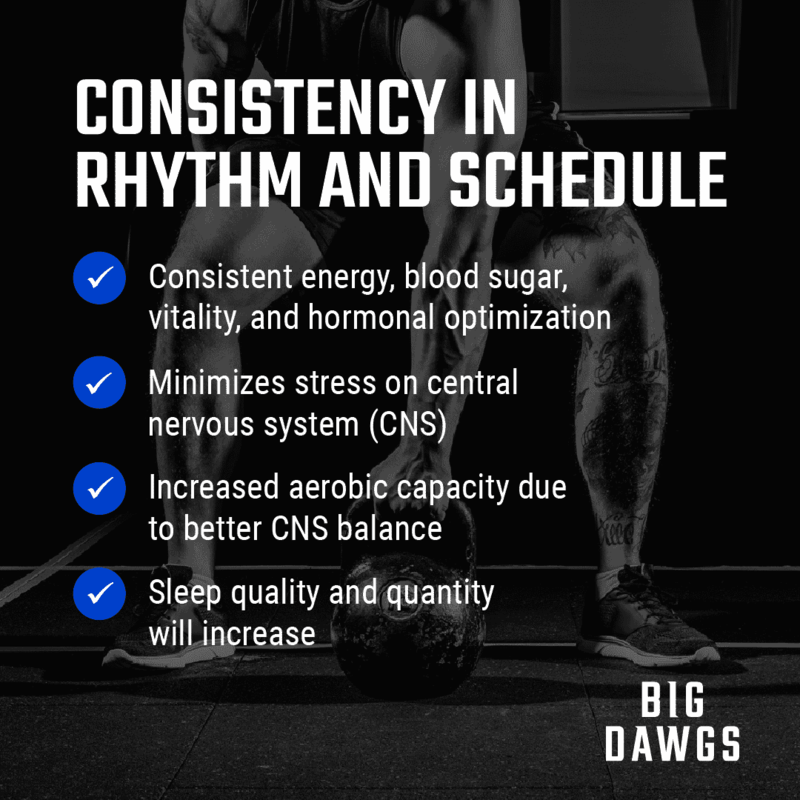 Great consistency with meal timing can play a major role in our ability to optimally digest our food, assimilate it, utilize it for growth and recovery. As I’ve described in a previous blog post (see here: http://www.thebigdawgs.com/bedtime-routine) consistency in sleep and wake times are vital to all aspects of our biology. Going to bed at the same time, getting 8+ hours of uninterrupted sleep, and waking up at the same time are arguably the most powerful tools we can optimize for our health and performance. From a physiological perspective, cortisol, our main stress hormone, and melatonin, responsible for regulating wakefulness, work antagonistically to regulate activity and rest each day. One action of melatonin is lowering body temperature as we transition closer to bed. Our body temperature needs to drop 2-3 degrees (F) for us to rest effectively. This allows our body to stay asleep and transition through the various stages of sleep. The more stimulated we are before bed time, extending out the presence of cortisol, we delay the onset of sleep and secretion of melatonin inhibiting a drop in core temperature which challenges our body’s ability to fall asleep causing extended sleep latency (the time it takes to go from a state of wakefulness to the lightest stages of non-REM sleep). Ensuring we are winding down appropriately (see the blog post linked above) we can allow our nervous system and body to transition into a state where it wants to rest allowing melatonin to secrete optimally, our core temperature to drop, and shorten our sleep latency. A final piece when looking at consistent sleep patterns, a poor melatonin profile (categorized by erratic sleep wake schedules and overstimulation before bed) represents a potential pathway for development of insulin resistance via inhibition of glucose-induced insulin release (Broussard). Our ability to effectively uptake nutrients, glucose specifically via insulin, is also strongly predicated on our ability to sleep consistently and effectively. Notice how consistent and deliberate all of his tasks are throughout the day. There are no surprises. Complete dedication to his craft. Let’s not dwell on the fact that he works out all day and you can’t, but rather takeaway the principles he displays of daily disciplined consistency allowing him to breed success. Become fanatical with consistency in your sleep, training time, and nourishment to allow yourself to become a byproduct of disciplined consistency, successful.